Can you check in the preferences window what your default item and photo templates are? (And that they were not deleted by any chance). 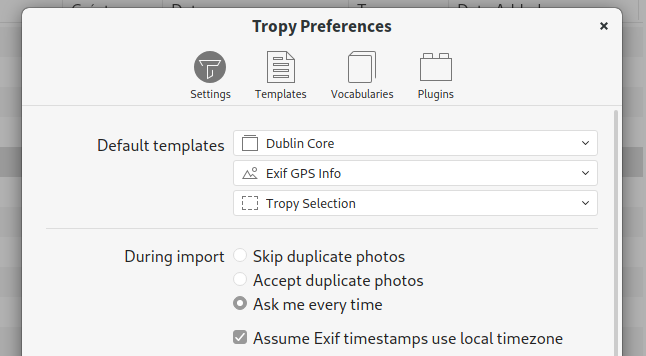 Preferences for photo’s or Tropy? And where do I find what the default photo templates are? If it fails like above, please select Help -> Show log files from the menu and copy and upload the project.log file here – this might help us debug the issue. Apparently it’s fine now, I’ll restart the programme more often from now now on prior to asking questions. Sorry I can’t help find the bug that caused it. I’ve been having this problem as well lately. I’ll try to import a file and the program will crash. My default templates are fine, however. You’re trying to import just a single file, right? Could you possibly share this file with us? Does the import fail for other files as well? Thanks!